Welcome to Super Bowl week. This week we will breakdown the positions for each team to give you the full report all the way up until we make our predictions on Sunday. A defensive battle does not appear to be in the cards for when the Patriots and Giants matchup on Sunday. The Giants ranked 27th in total defense in the regular season while the Patriots came in at 31st in total defense. Last year the tough defenses of the Steelers and Packers matched up but this year it is all about the offenses of these two teams. When analyzing defensive front seven for both of these teams it is hard to miss their size. Giants defensive end Jason Pierre-Paul is 6’5’’ 280 lbs. 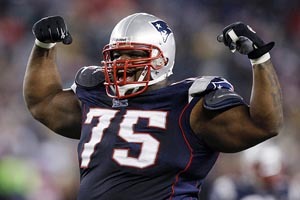 Patriots nose tackle Vince Wilfork 6’2’’ 325 lbs. Both of these guys, despite their massive frames, can get after the quarterback. In fact, only three guys (Osi Umenyiora of the Giants, J.J. Watt and Brooks Reed both of the Houston Texans) have more sacks than Wilfork. Despite playing in one fewer game than Umenyiora, Wilfork has 2.5 sacks to Umenyiora’s 3.5. But, outside of Wilfork and linebacker Rob Ninkovich (1.5 sacks), the Patriots front seven only has 3 total sacks this post season. The Patriots have seven total sacks in two games (3.5 sacks per game). They are going to need to step up their pressure on the quarterback if they plan to take down Manning and the Giants. One thing the Patriots front seven does well is tackle. The front seven of the Patriots have three guys with 12 or more tackles in the playoffs, lead by Jerod Mayo’s 17 tackles. As for the Giants, their front seven has really come into their own in the playoffs. Sparked by Jason Pierre-Paul’s blocked field goal of the Cowboys, this defensive line and linebacker corps has really stepped up. As we mentioned earlier, Umenyiora leads all players with 3.5 sacks in the playoffs. Linebacker Michael Boley (2.0) and defensive end Justin Tuck (1.5) are also members of the Giants front seven that have multiple sacks. But, just like the Patriots, the Giants are struggling to get more sacks from other areas. Outside of Umenyiora, Boley, and Tuck, the Giants have 3 guys who have combined for two sacks. The Giants, in three games, have notched nine sacks (3 sacks per game). The Giants are getting pressure on the quarterback without getting sacks. The Giants are tackling well and they currently have four guys in their front seven that have 12 or more tackles in the playoffs, lead by Chase Blackburn’s 20 tackles. When looking at these numbers, they certainly skew in favor of the Giants because the Giants have played an extra game because the Patriots had a first round bye. The two defenses are different. The Patriots run a 3-4 defense whereas the Giants run a 4-3. This is one of the closest position battles to decide but, having watched the pressure that the Giants front seven has put on quarterbacks in recent weeks, it is hard to give New England the advantage despite what the numbers might say. This could go either way but, in a close matchup, the Giants get the nod.